More than half the Czech population (58 %) is opposed to a traditional division of roles in the family, with the man as the breadwinner and the woman looking after the home and family. For a long time now, the public has been divided into two almost equal camps on whether looking after the home can be just as fulfilling as being in the workplace. According to a slight majority of citizens (53 %), a mother’s role in raising children is no more important than that of a father. The proportion of citizens who disagree with a mother’s dominant role in children’s upbringing is currently markedly higher than for previous surveys. In the May STEM survey, we asked citizens several questions with regard to their opinions on marriage, the family and the role of men and women in the family. Over twenty years of the TRENDS series of surveys, we have been able to monitor whether or not society has seen a shift in opinion on these issues. Even in the mid-nineties, Czech society was still divided on traditional gender stereotypes, which defined the man’s role as family breadwinner and the woman’s role as looking after the home and family. A majority of just over half the population agreed with this stereotype, with almost half disagreeing. The current survey indicates a shift in Czech attitudes away from this stereotype, with the majority of the population rejecting this traditional perception. Nevertheless, two-fifths of Czech citizens still agree with a traditional division of gender roles. When we examine the differences between the various sociodemographic groups, there is a noticeable shift in the opinions of certain groups over time. Specifically, while the attitudes of women have almost remained unchanged, there has been a shift in men’s opinions on the subject (in the past, the majority of women already rejected the traditional gender-role stereotypes). The latest survey also found a similarly significant shift in opinion among the group with a primary school education. 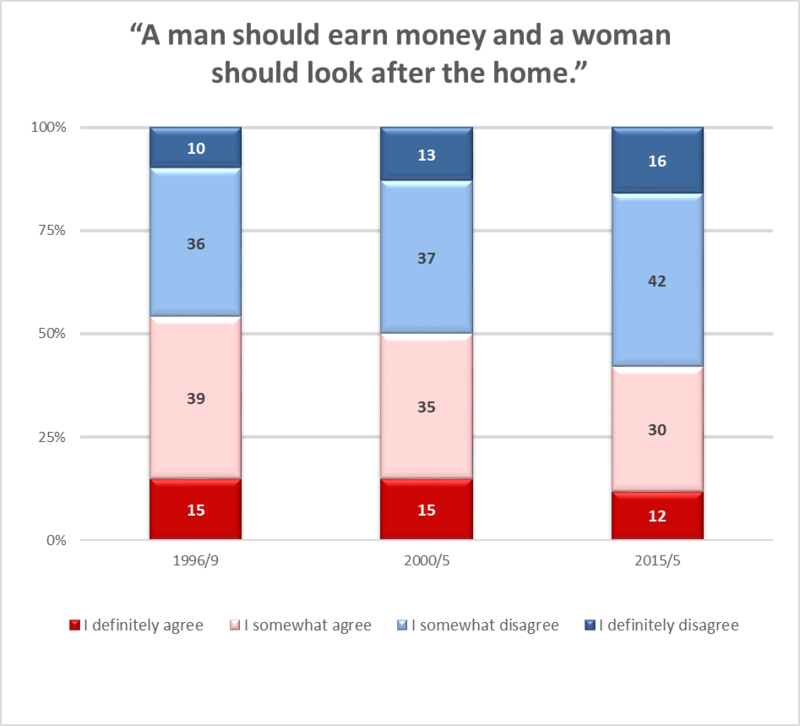 In 2000, some 61 % of this group was inclined to think that men should be out earning money whereas women should stay at home to look after the household. This figure stood at only 45 % in 2015. Whereas there are no substantial differences in opinion according to age, it is evident that while in 2000, opinions on the roles of men and women in the home varied significantly by age, nowadays the generational gap is narrowing on gender role attitudes. Czech public opinion regarding the value of work in the home has consistently remained equivocal. Czech citizens are split down the middle on the issue, with half believing that staying at home on a continuous basis is just as valuable as having a job in the workplace and the other half disagreeing with this opinion. This differentiation in opinion among the Czech population has been stable long term; the 1996 STEM survey held twenty years ago came up with the same results as the 2000 and 2011 surveys. The view that looking after the home and family on a continuous basis can be just as enjoyable and fulfilling as going out to work is held by more than half of people over 60 years of age (56 %), people with a primary school education only (54 %) and those with apprenticeships (53 %). Let us now focus on the attitudes of the Czech public towards the role of men and women in children’s upbringing. While fifteen years ago the majority of Czechs were of the opinion that mothers are more important in children’s upbringing than fathers, today less than half the population holds this view. There is no significant difference in the views of men and women or in the opinions of people in difference age groups. Only the less educated are more often inclined to believe that mothers are more important in children’s upbringing than fathers compared with the population as a whole (people with a primary school education: 56 %, those with an apprenticeship: 50 %, those with their ‘maturita’ (equiv. A Level in the UK, High School Diploma in the US): 43 %, university graduates: 41 %). 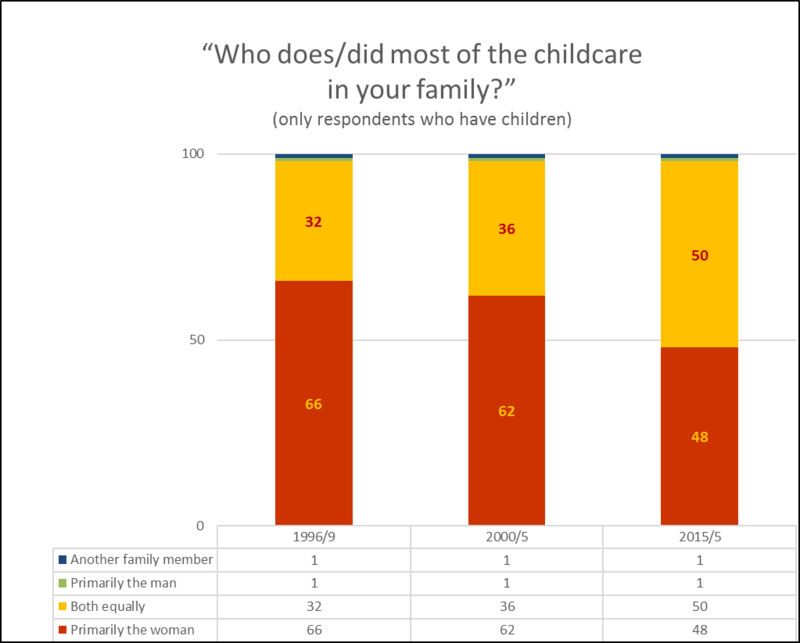 Changes in the division of gender roles in the family are also evident if we compare the responses given to the question regarding who in the family does/did most of the childcare. 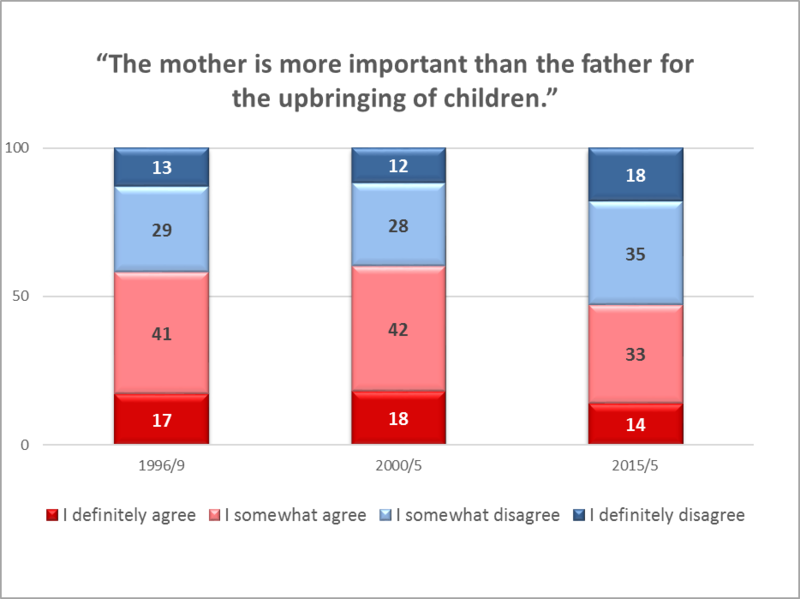 In the mid-90s, a two-thirds majority of respondents who have children said that it was mostly the woman who looked after the children. According to the current survey, this proportion is significantly lower, and indeed a slight majority of respondents said that both the man and the woman shared the childcare responsibilities equally. Changes in attitudes towards parental responsibilities are again more pronounced for men than for women. In 2000 almost two-thirds of men indicated that the woman did most of the childcare in their family. In the current survey this proportion has fallen by 19 %. 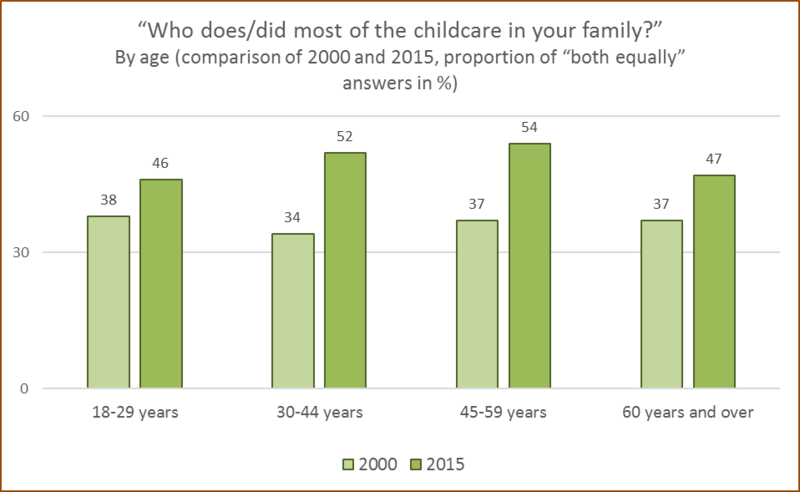 For the same period there was a 10 % decline in the proportion of women who indicated that the woman did most of the childcare. As with men, the attitudes of people with a lower level of education have undergone a similarly significant change. 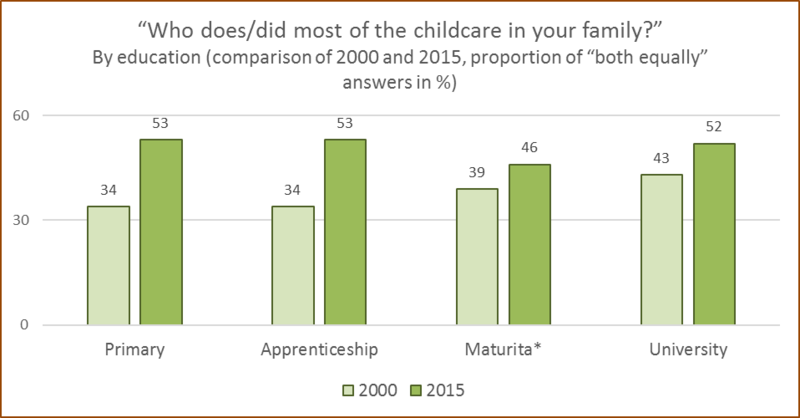 Over half of those with a primary education and those with apprenticeships indicated in the most recent survey that both parents do an equal amount of the childcare (as opposed to one third in 2000). Of the different age groups, the greatest shift in attitudes was recorded among the middle aged (those aged 30 to 59 years).